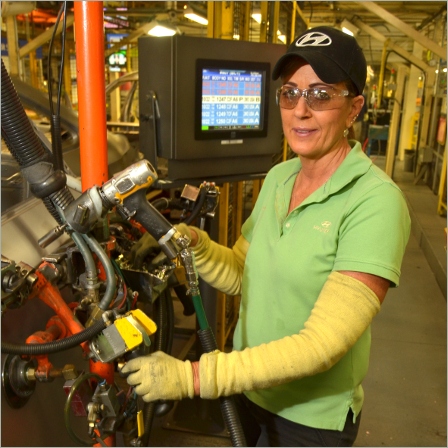 HMMA Team Member: Donna Lenning | Hyundai Motor Manufacturing Alabama,LLC. Donna Lenning works on the BC1 line in the weld shop. Her 10-year anniversary with HMMA is quickly approaching as she became a Team Member in November 2005. Donna says she had some experience in automotive and manufacturing before she came to HMMA, but she still had quite a learning curve to overcome in the weld shop. Back in 2005, Donna says the biggest challenge in her eyes was that the BC lines were constantly moving but the assembly line floor was not, so Team Members had to walk along to complete their tasks. “It was very difficult to do those processes while walking beside the car,” she recalls.